So, you have created a beautiful video that is ready to be seen by the whole world. What comes next? Where should you publish your video for maximum visibility, likes, and shares? If you have done Facebook live, should you download your videos and repurpose them? Mari Smith, the Queen of Facebook, shares her top-notch tips for video distribution in this webinar, the 2nd in the series “Creating Engaging Videos for Social Media with Mari Smith”. But before we dive into learning everything about video optimization, let’s recap what we have learned about video creation. Here are some crucial elements of doing your video, predominantly for Facebook but we will cover Instagram, too. For pretty much anything that you present on Facebook, you might also want to keep in mind Instagram. With the Ads Manager, Facebook makes it very easy to optimize reach to the exact perfect audience you want: just leave the Instagram placement selected. Obviously, you might just want to advertize on Instagram, but in this case, you might want to keep in mind that you can only do 60-sec video ads. In any case, according to Mari, Facebook really wants you to optimize for mobile. Some 90% of Facebook users access on mobile devices, and of course, Instagram is only mobile. So, what does that mean? It means that you want to focus either on square videos as they are bigger and take more space in the newsfeed, or portrait. Also, you might want to focus on ‘snackable’ content, like literally 6 to 15 seconds. Of course, this is relevant to ads: obviously, you wouldn’t probably want to do a Facebook live for 15 seconds. But Facebook is “pivoted”, if you will, with their drive to purchase ads insofar as it must drive business. So any time you invest money in Facebook ads, it must give you an ROI. Any time you invest money in Facebook ads, it must give you an ROI. Also, Facebook has their new television that is called “Watch!” It’s been anticipated for quite a while, and sure enough, it’s here and available on mobile, desktop and via their app, so you can apply and have your show featured on Watch. To Mari, Facebook TV is where YouTube was 7 or 8 years ago, and this is exciting as it brings more opportunities. 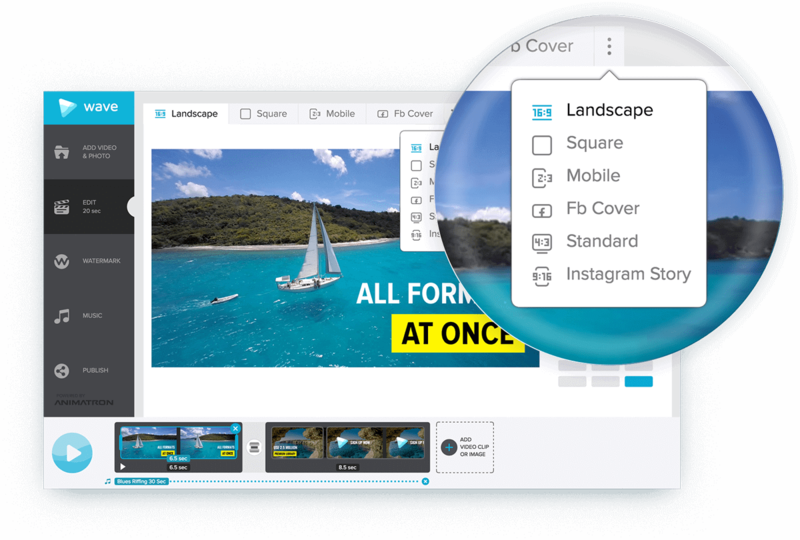 Since Mari Smith puts so much emphasis on optimizing for mobile and reformatting video to square, portrait, and other popular formats, she recommends using Wave for easily changing the video aspect ratio. Basically, when making a video, you are simultaneously creating 30+ versions of the same video, for each format that is available in Wave. Tip 1. Always upload natively. Now, there might still be some people confused about that, so just to get it straight: upload natively means uploading your video directly to Facebook. It does not mean sharing a YouTube, Vimeo or Wistia link. These platforms are great, but Facebook will not give you as much reach and visibility if you are posting a YouTube link versus if you are uploading a video natively. Obviously, if you can’t find a person’s video on Facebook, and sharing a YouTube link is the only way, go for it. You DON’T download other person’s YouTube video and upload it to Facebook. Tip 2. Shorter is better, especially for ads. Facebook says, more people watch less than 15-second videos to the end. So, how do you get your message across in such a short time? Mari suggests starting a video with some action right away. Don’t do any transitions or slow motions because people just don’t have any attention today. Tip 3. 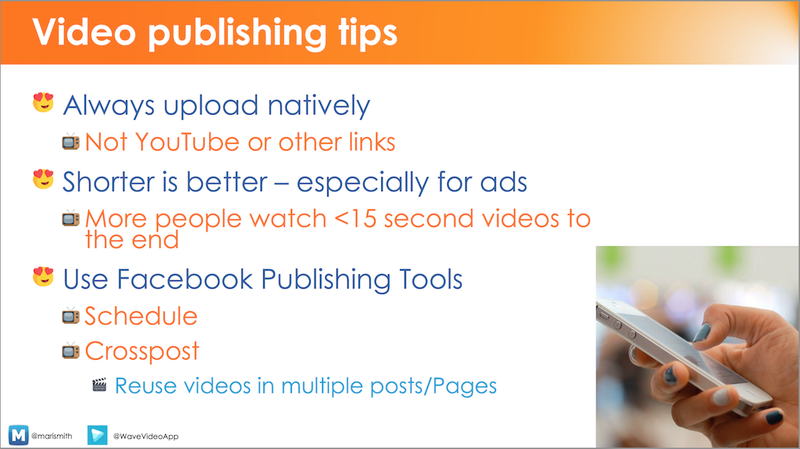 Use Facebook Publishing Tools. With the help of these tools, you can: – schedule your videos – crosspost them: the ability to reuse videos in multiple posts or pages. Facebook Live is a big hot topic, especially now with the Facebook Watch, when people start thinking of having their own TV program, all on Facebook. Am I going live by Mobile or Desktop? For mobile, you are going to have more options in terms of filters, masks, inviting viewers to join. You will need to decide whether you need those for business, though. BeLive.tv. This one has a unique place in the market because they do interview style (side by side), talk show, etc. You can even put people’s comments up on the screen as you live stream! BlueJeans. Using this tool, you can have up to 50 people on webcam. Great for private online groups. eCamm Live. This one’s great for when you want to use a prerecorded video, like the ones made in Wave, and stream it live on Facebook. Wirecast. Mari calls this tool a “granddaddy”. This is the top choice of a lot of professionals. Just think about all the opportunities these 3rd party apps for Facebook Live video bring! You can do interviews and talk shows, put people’s comments on the screen (and people LOVE seeing themselves featured on the screen), and whatnot. Create great videos first and edit them as you wish. Upload them to a 3rd party Facebook Live Tool. Now, Mari emphasizes the importance of the relationships and being authentic when live streaming. A lot of times people would start broadcasting a pre-recorded video, and the viewers would start asking questions like, ‘Is this live? !’, and the presenter wouldn’t even notice them. You definitely might want to be as authentic and available to your audience as possible, even with pre-recorded videos. Mari calls this problem “Faux Live or Real Live?”. 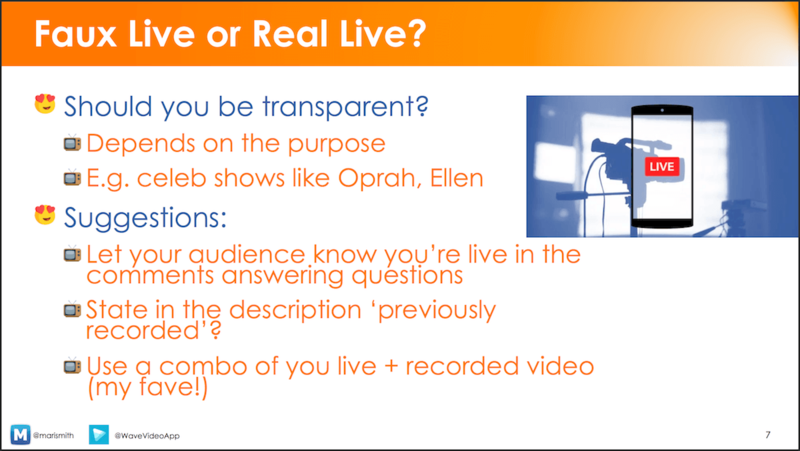 Should you be transparent when not doing the “real live” live? It would depend on the purpose. For instance, celebrities like Oprah or Ellen DeGeneres oftentimes broadcast pre-recorded videos that you could tell were recorded in a studio and have already been aired before. Now, they are repurposing it by broadcasting it live. State in the description ‘previously recorded’. This one is a bit tricky, and here’s why. After a live video ends, Facebook records it and puts it on your page. Technically, once your live video ends, it IS recorded by Facebook, so having the tag ‘previously recorded’ might be a little misleading for the audience. Use a combo of you live + recorded video – Mari’s fav! Now, when you finished going live, you might want to optimize your video for more reach. How do you do that? Add captions! You can use Facebook or tools live rev.com for transcription. You don’t have to do captions for the whole video but adding them for the first several minutes is a good idea. Apply the Mari method to make sure you get maximum clicks, shares, and likes for the allocated budget. Repurpose video for other platforms. For instance, after going live, Mari would also upload her videos on YouTube to maximize reach. If you wanted to, it could be an edited version. If you are putting your video on Instagram, you will need to repurpose video since Instagram only allows for videos that are less than 60 sec. Use apps like Wave video app for editing your videos to make sure they fit perfectly any social platform. Include your blog/website. Mari suggests embedding videos from different social platforms like Facebook and YouTube, which might help you get more views. Drive traffic from other resources to Facebook. Every video you post on Facebook has its own unique URL. Include video in your email marketing. Video itself wouldn’t embed in an email but you can do a thumbnail. As for repurposing your Facebook cover video, you can upload it to Twitter or YouTube as well as embed in a blog post. Here are a few examples.